Free Shipping Included! 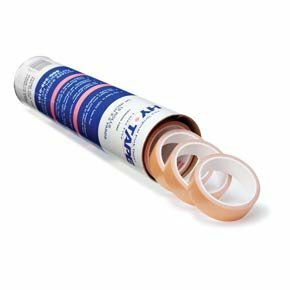 Hy-Tape Pink Tape, 2'' x 5 yards (TUBE OF 6), 20LF - Pink Medical Waterproof Surgical Tape by Hy-Tape at Medical Service. MPN: 120LF. Hurry! Limited time offer. Offer valid only while supplies last. Hy-Tape® is designed to perform in critical situations. The gentle zinc oxide adhesive holds tight but releases gently protecting delicate skin. Hy-Tape® is designed to perform in critical situations. The gentle zinc oxide adhesive holds tight but releases gently protecting delicate skin. Hy-Tape actually resists moisture, conforms to body contours and adheres firmly to oily and hairy skin. And, most importantly, it won't break down over time, so skin remains intact promoting faster healing and reducing infection. List is for a tube of 6 rolls. Each roll is 2" x 5 yards. If you have any questions about this product by Hy-Tape, contact us by completing and submitting the form below. If you are looking for a specif part number, please include it with your message.